This Easter we have been drawn into the story through the art of He Qi. These windows into the journey of Jesus - through death on the cross and into the new life of resurrection - invite us to find ourselves in the story too. Jesus, gathered with his best friends, is confronted with an intense moment of decision. He knows that the things he has said and done are about to get him killed. That he is about to be betrayed by one of his friends. That he is going to be executed as an enemy of the state. And as an enemy of his own religion. Should he change course, or should he keep going on? And his friends are asleep. Surrounded by people, even those who are close to him, but feeling alone. An experience that I recognise too. Immersed in a world of noise, activity, friends, family, church, community… but sometimes still feeling alone. 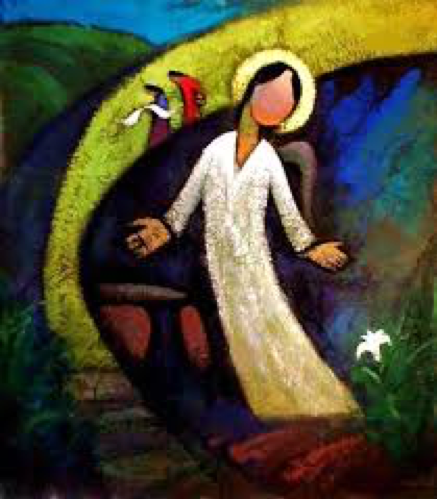 Jesus reminds us that God enters into that space of aloneness, and is present with us in it. And sometimes I’m the one who is asleep. Asleep to those around me, to those who need me to be present. So this Easter I’m reminded to stay awake. To remember that I’m not the only one in this story. That there’s more going on here, and that there are people who need me to stay awake. That together we would find peace. Forcing a system to see those whom it wishes to forget. Our wanting, his edging toward a certain demise. Mine is a sacred scared lie. I struggle to keep looking upon His suffering because I find mine mirrored there too. For hundreds of years we have seen the death of Jesus as a personal remedy for the impending after life judgement of our sinful condition, a kind of get-out-of-jail-free-card that secures our eternal destiny. We have somehow become infatuated with our individual self-importance, or lack thereof and missed the over-arching narrative. Jesus died as an agitator of the imperialistic regime, a nonconformist who refused to submit to the power structures that were dehumanising people. He constantly pointed out the societal sins that were dominating peoples lives. The cross is not just about your misguided personal view of God's disappointment with your moral condition, but more so about the reigning principalities and powers that dominate and influence our everyday lives. 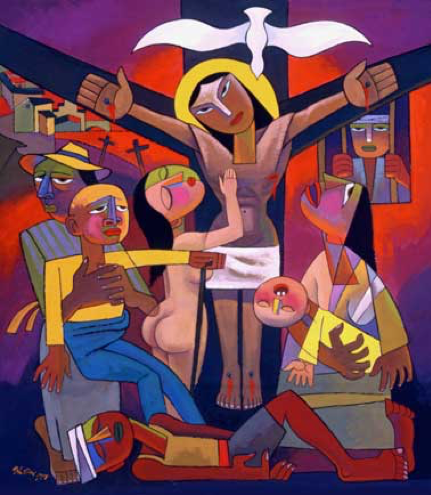 In He Qi’s confronting image of Jesus' crucifixion the central image of the cross is surrounded with pictures of the plight that faces our ability to function as a society. Racism, objectification, injustice, exploitation, neglect, imperialism, are just some of the all-embracing brokenness that affects us all. The real SINS that Jesus confronted and eventually gave his life for show us the real good news story of a gospel that challenges us all to lay down our life for a better world. Today I give my spirit, the very breath of my life to the finishing work of Jesus the Christ. I embrace the mantra ‘It is finished’, a reminder to work toward the ‘end’ of all that dehumanises us, for the betterment of humanity and the transformation of society. "Looking for ways to make your Easter Service more Biblical? Hold it at sunset and only invite the ladies"
It is a clever satirical attempt at portraying a group of women - specifically Mary of Magdala represented in this image - who stayed near the grave of Jesus after his death. Mary is grief stricken at the realisation that Jesus, whom she had accompanied in his life and his death, was no longer laying in his tomb. Her brothers had come and gone from this place, yet she for some reason lingered. Her faithfulness to Jesus was rewarded by a beautiful encounter as he revealed himself to her in his risen body. ‘Mary’, he softly assured her, ‘Rabboni’ she replied, with a great sigh of relief. He Qi’s image of Mary in the Garden portrays one who remains, one who stands true, one who doesn’t run or hide in the face of adversity. She is patient, confident, trusting and hopeful. She can hold the paradoxical experience of death and life together, darkness and light, grief and joy. Mary Magdalene is a role model, one whose faithfulness to her God enabled her to remain strong and upright, embracing tears in the night, and joy in the morning. This garden exchange invites me into the story of Easter. I, like Mary, am overcome with awe and wonder at this resurrection moment. This encounter pulls me into worship. What did Jesus die for?Clint Gibson April 11, 2018 What on earth did Jesus die for?